Have you ever had the urge to create something but when you actually make the attempt, it looks like a 3 year old made it? Have you ever had an image in your head but when you draw or paint it, your kids laugh at you? Yeah, well that’s me. I’ve known for a while that I have a crafty side, but I’ve just never found a way to express it. I tried bow-making because I really love hairbows and fancy ribbon. I’ve tried painting and although some of my paintings come out pretty nice (if I do say so myself) they still look a tad juvenile. My friends encouraged me to try scrapbooking and as much as I love all the pretty paper and embellishments, the thought have all that stuff in my house is enough to put me over the edge. You have to understand how bummed out this makes me because I’m left with the crafty feelin’! I have the ideas in my head- I just haven’t found an outlet. Two weeks ago, while surfing one of my favorite sites, Etsy, I stumbled across some fun prints. There are over 30,000 items in the wall décor, party invitation and printables categories on Etsy, some of which are quite expensive. I decided to try to make some of the items myself using Microsoft Powerpoint and oh my, I did it! The first few room signs I made for my girls came out really nice. I moved onto a more difficult project: my family tree, which actually looked good maybe even fantastic! I can’t wait to give the tree as a Christmas present. Before I knew it, the creative juices were flowing and I found that Powerpoint just couldn’t do exactly what I needed. I knew of a few super expensive illustrator software titles but didn’t want to make a huge financial investment, so I searched and searched until I found something for free. Enter: PicMonkey. PicMonkey is a photo editing site that contains a ton of overlays, clipart, shapes, etc. I searched for tutorials and before long, I was creating wall décor and even my own clip art! I am totally hooked. This little tooth fairy is my favorite project so far. I want to create more and more. I hope that someday I can turn my crafty hobby into a business! Attention Area Moms: There’s One Week Left to Become a Signature Moms Blogger! 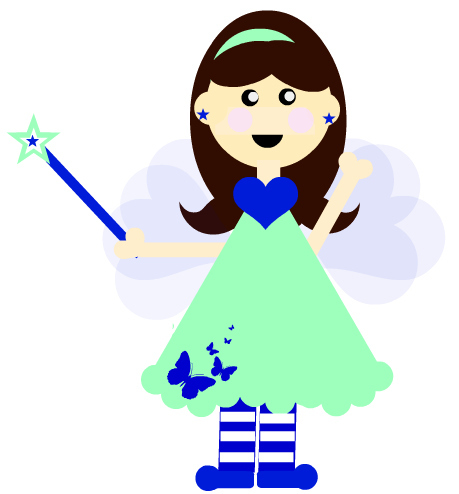 Very cute tooth fairy. What are you doing with your art exactly? I would like to see pictures of it!